I hate to burst your bubble, but there are no cookies in this breakfast cereal, but there are a lot the ingredients you would use to make cookies so there. I love breakfast. I love oatmeal. And I love experimenting. I am constantly cooking it in different kinds of liquids etc. I love the way this one turned out so I thought I would share 🙂 Oh! and no need to add sweetener, the raisins do the trick! Place the almond milk, sea salt, nutmeg, cinnamon, rolled oats, and raisins in a sauce pan and bring to a boil on medium high heat. 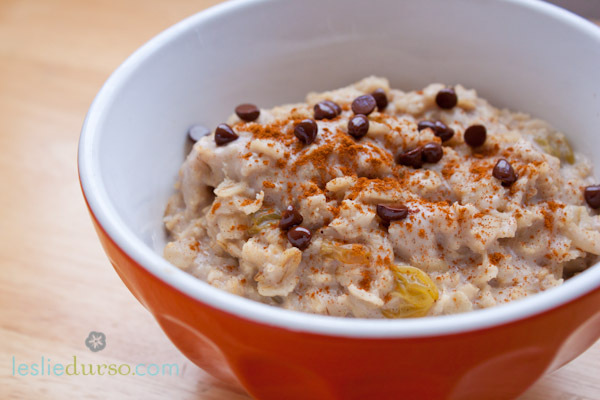 Reduce the heat to medium low and let simmer for 5-7 minutes or until the oats are tender and the raisins are plump. Serve immediately with toppings. Optional: Want some more protein? Add some quinoa and a little more almond milk.